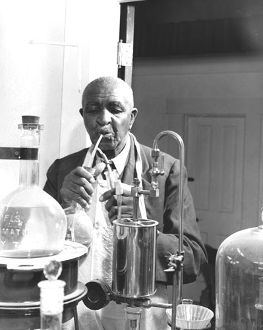 George Washington Carver literally came from nothing. Born into slavery in southern Missouri, Carver created his own success through education - as a youth he walked 10 miles to a new town, just to go to school. He eventually ended up at Iowa State University, earning a Masters Degree and becoming the first black faculty member at ISU. Carver rose to fame during his tenure at the Tuskegee Institute. He became a national advocate for American peanut farming, a syndicated columnist, and was recognized as one of the 20th century’s most brilliant minds. Carver never wavered from a belief that hard work, sacrifice, and a faith in Jesus Christ would destroy racism and societal degeneration – he lived the life from beginning to end and his contribution to our nation is beyond value. In honor of George Washington Carver’s life and legacy, we’ve added peanut butter flavoring to this full city roasted blend of Central and South American blend of beans.